As the composite outcome of all the positive elements in the whole previous history of Indian thought, Bud­dhism shook the very foundation of the hoary edifice of Brahmanical orthodoxy. It disputed the authority of the Scriptures; vigorously condemned the sacrificial rites and rituals of the Vedic Natural Religion; it denied the existence even of an impersonal First Cause (the Brahman of ·the Upanishads); and is discarded as the doctrine of Soul. For the first time, there began to develop in India a system of truly philosophical thought, having for its point of departure the atomism of the Nyaya-Vaisheshik system and the rationalist-mechanistic conception of Nature contained in the Sankhya system. Moreover, the Buddhist philosophers, particularly of the “realist” (Sarvastitvavadins) and the “nihilist” (Sunya­vadins) schools, took over the sceptical views of the earliest -ideological rebels who preceded the formulation of the materialist systems of the Vaisheshiks and Sankhyas. But the so-called “nihilism” of the Buddhists is to be traced back directly to the dialectic view of nature: that the con­tinuous change in bodies, owing to atomic combination .and separation, necessarily involves a continuous process of the old perishing and the new growing: This dynamic view of nature was formulated in the Valshesluk system, and subsequently elaborated by Kapila, who, notwithstanding his unnecessary metaphysical deviation, was essentially a materialist. The Buddhist “nihilists”, however, did not reduce everything to non-existence as had been done by the older nihilists. The Buddhists visualized everything in an endless process of constant flux. They challenged the notion of an eternal, changeless, absolute existence. The logical consequence of their dynamic view was the rejection of the dogma of the Absolute Truth revealed in the Vedas. All the three schools of the Buddhist philosophy (including the Idealists - Vijnanvadins) taught that every existence is momentary - in a state of eternal flux. Their doctrine controverted the basic assumption of the orthodox Hindu philosophy of the Vedanta system. On the basis of the materialistic and quasi-materialistic Vaisheshik and Sankhya systems, Buddha reversed the relation between the spiritual and material beings. As a consequence of the reversal of the order of sequence, their relative values were also revaluated. Buddha held that soul is a byproduct of the very being of man, governed by the laws of nature. Thus differentiated from, and contrasted with, “the spiritual” being could only mean physical being. The Buddhist conception of individual consciousness does not carry with it any assertion or implication that “the Ego” exists or is, in any way, a reality. What really exists, according to Buddhism, is sanskaras - activities and impressions man receives in course of these activities. The sanskaras, again, work out in a casual series. The soul does not inspire the activities of man's life; on the contrary, it is the sum total of impressions accumulated by organic activities. The materialist essence of Buddhlst philosophy, although couched in an ethico-idealistic terminology, stands out in a clear relief under the fierce attack of its Brahmanical opponents. Sankaracharya, for example, exclaimed in exasperation: “Thus, blind karma is perma­nent, having the power to produce an infinite number of conscious individuals—souls!” A correct evaluation of consciousness, which implied devaluation of the soul, the denial of its spiritual nature, and precedence over physical being, led Buddha to do away with the belief in God, who can be conceived philosophically only as the “Universal Soul”. For the solution of the question of life, Buddha found that belief in God was useless. Since the existence of God, as the spiritual cause of the 'Universe, can be estab­lished only upon the assumption of the extra-materiality of human consciousness, the rejection of the doctrine of soul necessarily leads to the denial of God. God cannot be reached except through the doctrine of soul. The Realist school of Buddhism defines the existence of a thing as its causal efficiency. According to this essen­tially materialistic doctrine, the existence of an abstract principle cannot be proved. The Nihilist school is deduced from the Realist. It holds that, since everything is being constantly destroyed, a void – nonexistence – is the cause of everything. According to Sankaracharya, they preached the following doctrine: “Nothing can become a cause as long as it remains unchanged, but has to that end undergo destruction, and that thus existence springs from non-existence only”. The Buddhist Sutra itself is: “On account of the manifestation (of effects) not without previous destruction (of the cause).” The seed must decompose, become non-existent as seed, before the plant can grow. The world is thus visualized as a self-originat­ing, dynamic process. There is no difference between the Realists and the Nihilists, if their common materialist essence is divested of scholastic sophistry. 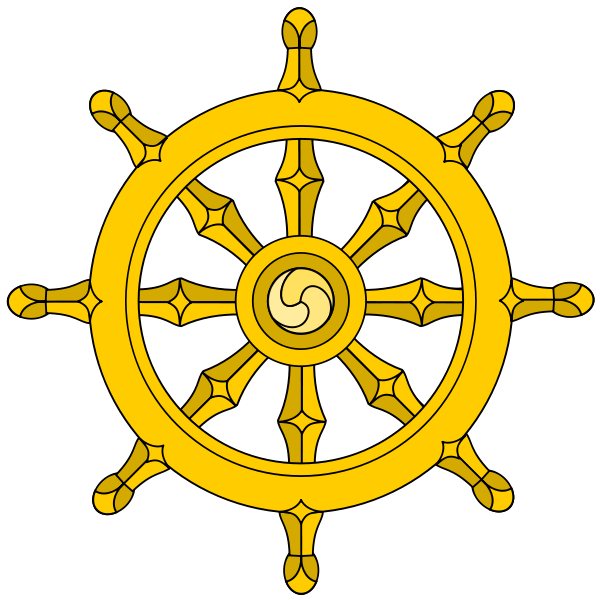 Buddhist materialism was based on Vaisheshik atom­ism. It can be summarised as follows: There are two aggregates of existence - external (material) and internal (mental). But mind presupposes the existence of an atomic combination. The external, composed of the “elements” (bhuta) and “elementals’ (bhautika), embrace the outside nature as well as the gross bodily organs. The former is made of elements which are earth, water, fire and air. These, in their turn, are formed respectively of the differ­ent kinds of atoms; whereas the latter are made of the “elementals”, that is, diverse combinations of the elements. Since mind and things mental are conditional upon the existence of an atomic aggregate, the “internal” is evidently not an independent being; it grows out of the “external”. In other words, the mental is derived from the material. This is further evidenced from the division of the “internal” into five groups (skandhas). They are sensation, knowledge, feeling, verbal knowledge and im­pression. These are all diverse functions of the bodily organism - an aggregate of atoms. No school of Buddhist philosophy admits the existence of any extra-natural or metaphysical intelligence, such as God or Soul, which might bring about the first aggregation of atoms. There­fore, atomic combination must be visualized as a mecha­nical process out of which the so-called “internal”, that is, the intelligent part of existence, arises. But the Buddhist philosophy stopped short of this logical conclusion from its own premises. The reason of that shortcoming was the idea of “Nirvana”, which was the characteristic feature of a psychological condition created in an atmosphere of social dissolution. The world is full of sorrows and miseries. One must run away from it. The cardinal principle of Buddhism, namely, “Nirvana”, contradicted the entire system of Buddhist philo­sophy. Sankaracharya pointed out that contradiction. “Nor can the atoms and skandhas be assumed to enter on activity on their own account, for that would imply their never ceasing to be active.” The ideal of “Nirvana” is the cessation of all activity. According to the Buddhist mechanistic view of nature, atoms and their aggregates are auto-active. Therefore, as Sankaracharya pointed out, their activity can never cease. The material world is eternal. The ideal of “Nirvana” represented the nihilism of Buddhist philosophy. It was the quintessence of the ideo­logy of social dissolution. The positive materialist charac­ter of Buddhism made it victorious, for a time. But eventually, it was bound to be overwhelmed by its own contradictions. Buddhism was the product of the social conditions of the epoch. It was the ideology of those who could not deny the effects (pains etc.) of the material existence. For the multitude, the conditions of social dissolution only meant pains. So, that was the effect of their material existence. On the other hand, the initial triumph of Buddhism was due to the fact that it secured the adhesion of a rising class which rejected the Brahma­nic dogma of other-worldliness. According to Sankaracharya, Buddha himself was an idealist. Nevertheless, he propounded a realistic philosophy, “conforming himself to the mental state of some of his disciples.” It is record­ed that hundreds of merchants were associated with Gautama. The idealistic deviation of the Buddhist philosophy was caused by its having enlisted the patronage of the upper classes. In order to refute the Brahmanical dogma of the Eternal Truth, the rebels expounded the doctrine of the momentariness of everything. In course of time, the doctrine of temporariness was applied not only to the physical, but also to the mental phenomena. The ad­verse effects of the social existence, pain, sorrow, etc., were also declared to be momentary. One step farther, and Buddhist philosophy shifted its moorings from materia­lism to idealism. What is momentary is not real; there­fore, pain etc are but ideas which have no objective causes. They are only menal states. There does not exist anything but ideas. But the other cardinal principle of the Buddhist philosophy could not be altogether dis­carded. The phenomenal world is without a beginning; hut ideas also have always existed in a chain of mutual causality. They do not need any external object. They are self-existing. The idealist deviation rendered Buddhism susceptible to Brahmanical influence. The Mahayana School be­came a replica of Hindu ritualism. Nevertheless, Bud­dhist idealism retained its philosophical character as against the theological nature of the Brahmanical metaphysics. It never denied the existence of the world; it vaguely came near to the modern philosophical conception of the identity of the object and subject. The preoccupation with the idea of “Nirvana” involved Buddhist philosophy into a maze of metaphysical speculations. In that realm of pure fantasies, the Brah­min scholastics not only held their own, but before long turned the table. Sankaracharya had no difficulty in proving that the entire system of the materialist-rationa­list Buddhist philosophy was incompatible with the doc­trine of “Nirvana”. The priestly monopoly of ideology was reasserted after it had been shaken by the Buddhist Revolution. Any way to get a copy of 'Materialism: an Outline of the History of Scientific Thought'? The book seems to be out of print. We will, however, try to scan them and upload it soon. Thanks! Please if you can, update this comment section whenever it is complete. Interesting to relate to the essays of Lafcadio Hearn?